Sunday evening rolled around. The approaching twilight taking me by surprise after a bright day. I’d popped along to see some friends perform in a burlesque show in a pub. In a back room. Does that sound better or worse than it being in the main bar? As it happens I was slightly late arriving. My brain had gone into auto pilot and I’d starting driving my usual route to work. Of course, I was several junctions in the wrong direction when I remembered where I was going. As a result I squeezed in between the first and second act. Then scrambled around and found a stool in the dim light and sat down to whoop, laugh and wonder at my talented friends. My first opportunity to visit the bar was the interval. All that whooping laughing and wondering is thirsty work. I took my first opportunity to admire the pub’s decor. One ceiling was covered in vinyl record covers. 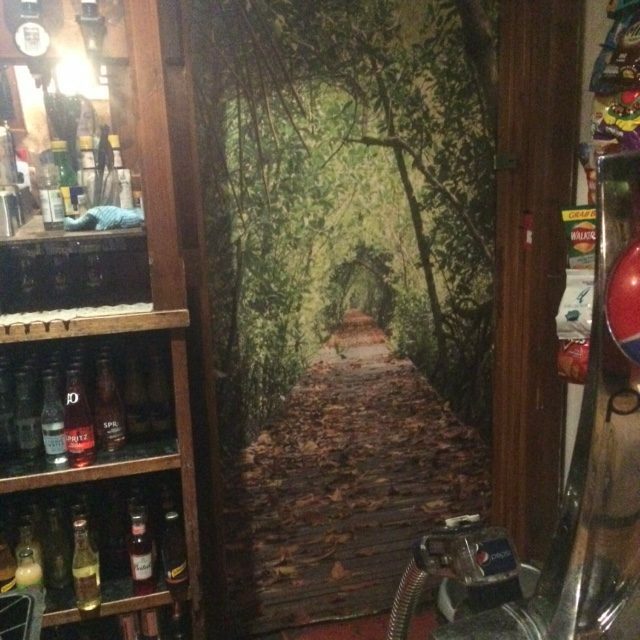 Then at the back of the back I spotted what looked like an exit to a secret hidden world at the back of the bar. I think it might be the Flitch Way. The image made me recall one that I took myself (although not so good) some years ago. I wanted to try and capture the feeling of being in a secret tunnel made of green. This image does that so well. Imagine being able to walk into the image. To be able to pop away for a few minutes of calm anytime you wanted to.